They're back again! 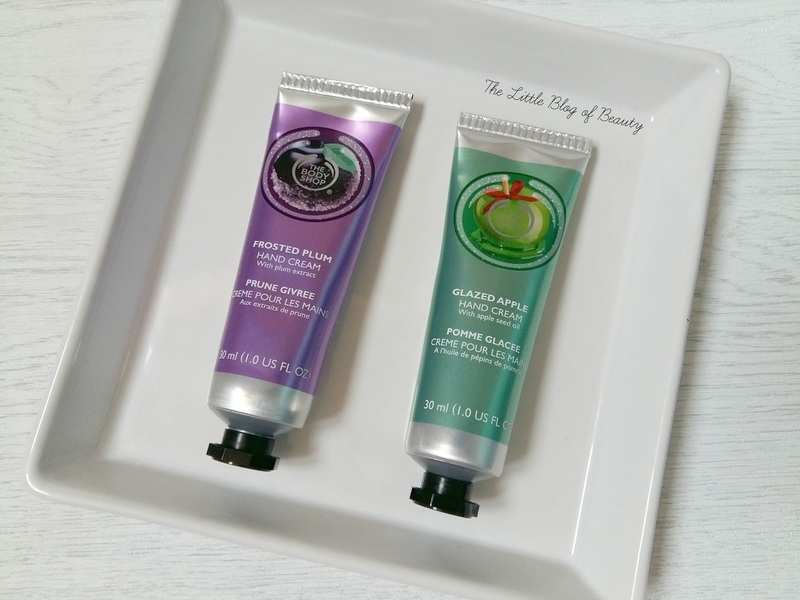 I'm a huge fan of The Body Shop's little hand creams and last Christmas I was very excited to see they'd released some new limited edition scents in their Christmas collection. Last year we had Glazed apple, Frosted cranberry and Vanilla brûlée and I completely fell in love with Glazed apple. I originally bought one of each scent to try as they were on 3 for 2 when I bought them, but when I tried to buy some more Glazed apple was sold out, so I never managed to get my hands on any more. I've been waiting with baited breath for this years Christmas collection to see if Glazed apple would make a return, and of course it did. The Body Shop would have been crazy not to bring it back if it really was that popular last year! This year has seen the return of both Glazed apple and Frosted cranberry, but Vanilla brûlée has been replaced with Frosted plum. Although I did like Vanilla brûlée I think Frosted plum will probably be more popular. This year has seen a price increase for my favourite little hand creams but they're still a very reasonable £4 each. They're the perfect size to drop in your handbag and they're the only hand creams I will currently use throughout the day because they absorb so quickly and don't leave any kind of greasy feeling behind. Glazed apple has a gorgeous sweet, crisp, fruity scent that makes my mouth water and Frosted plum has a slightly more tangy but still sweet and fruity scent. I've only bought one Glazed apple one so far this year, which may well have been a mistake if they completely sell out again, but I'm glad I got my hands on at least one if they are going to sell out again. If they were on offer I would have also picked up a Frosted cranberry, but I didn't want to spend £12 on hand cream in one go. I'm pretty sure I will be heading back to pick up another Glazed apple and Frosted plum (if they don't sell out) and if they are on 3 for 2 I'll definitely treat myself to one of each. The Body Shop Christmas hand creams are £4 each and available in store and on The Body Shop website. Have you tried The Body Shop's hand creams? I've been wondering what to get some of my family members for Christmas and this is a great idea!